An MD5 Context Menu utility program? How useful. The Golden Rule is in every major religion, minus one. How to stop a giant monster, and the follow up is interesting too. 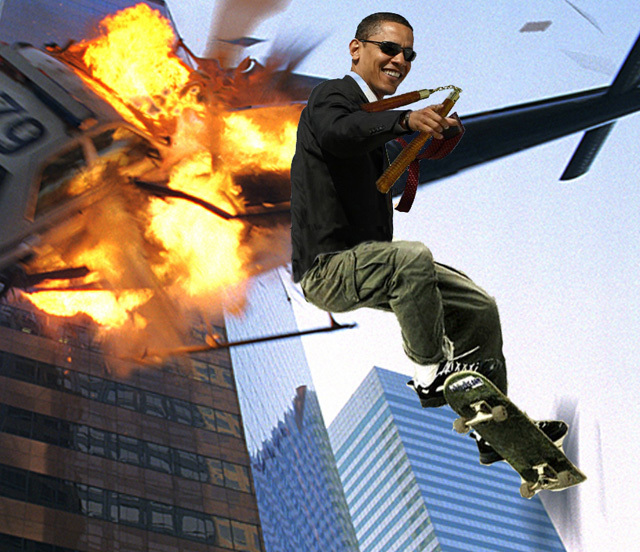 Barack Obama seems to be getting cooler everyday. When Richard Feynman plays his bongos, everything just makes sense. Photoshop Disasters – as addictive as it sounds. Oh yeah, it’s National Grammar Day for another twenty minutes. Some are excited by this, yet I still can’t spell grammar right on the first try. Finding your blind-spot; understanding your blind-spot. Prince William may be back, but more interesting is the BBC’s part in this story. This should make up for the spiders: Mocha and his first broccoli. This picture will ruin your weekend. The Element Song, something every Major General or cartoon writer should know. The Presidents of the United States. The Nations of the World (dated). The Fifty State Capitals. If the Animaniacs didn’t sing it, I shouldn’t have to know it. I finished reading Old Man’s War by John Scalzi last night. It’s another military sci-fi book. Yes, I know – this is not a healthy habit and I need to quit today. Maybe tomorrow. The book’s interstellar politics can be easily described through the board-game monopoly: many alien species like planets similar enough to our own tastes that first contact typically occurs over territory disputes; humans are essentially boxed in from all sides by other species; if humans wish to remain competitive in a few centuries’ time they better start invading. It’s interesting how ethics are fundamentally based on self-preservation. Earth is essentially excommunicated from all human colonies. This is to prevent disease as well as the culture shock of inter-species war of this scale. For example one encounter involved some bad aliens landing on an unarmed colony and enslaving all the colonists (enslaving in this case meaning caging everyone, milking the males, impregnating the females, and finally cooking up some human-flavored veal). So the universe is a bad place where humans are not that popular. The military’s attrition rate stays around 80% mainly because every war they fight is completely different from the last. So enlistment takes place on Earth where no-one has a clue what they are in for. People sign up because it’s the only option to leave the planet. And that’s where the title comes from: enlistment is only accepted on the applicant’s 75th birthday. The recruit is then genetically modified to become a soldier who will (hopefully) be capable to compete with all the unknown alien badguys out there. I swear it makes more sense in the book. The book is a quick read, about eight hours. It’s not “life-changing good” but still very enjoyable. The characters feel genuine and are hilarious which is what makes this book so much fun. Blood-powered touchscreen “tattoo” with Bluetooth connectivity. Is it bad that I want one? Wired profiles Consumer Reports’ Secret Shoppers. › The Future is Now! Delicious restaurant management Papa's games and Papa Louie games.